Since a week I am playing live every night. The action in the new Casino Esplanade is besides the fact that they only 2 tables very good. They spread NLH 2/4 or NLH 5/10 but those little games start rocking after some time. They good thing there is you see new players all evening, they have seen poker on TV and now try it for themself. Also, many regulars have problems adjusting to no limit (coming from either limit holdem or pot limit). A typical situation is like this: 2 and 4 blinds gets posted, UTG+1 raises to about 30 (!) and you get 6 players (!) seeing the flop. Overall I am slighly up for the last weeks but I have swings. In big pots I have some river problems, lol. And of course I am playing way to many hands, as always. I execuse this with my ‘superior post flop skills’ which are most likely nothing more than wishfull thinking – and even when I am right I get unlucky here and there. There are some examples of more correct preflop play (hello minimi!) but I doubt he they are sqeezing enough out of the game as many opponents simply play so so bad on all streets. Online play was a disaster over the last 4 weeks. I played lots of hands on 30/60 and 50/100 shorthanded but after some initial winnings I got owned. I even went back to fullring 15/30 for some time (normally a sure confidence builder) but even there I lost a lot. I took 3 days off now and will get back into the games today. In the Real German Poker Champion event I busted out in round 1 against Marten with 1:3 games. Marten played well and won some key hands, I could only win in 7card stud and even that was close. In NLH money went in with slowplayed KK vs. slowplayed AA – in PLO he won the deciding hand with QQKx vs my KKQx with a Q on the flop… congrats, good luck in round 2. Current results here. 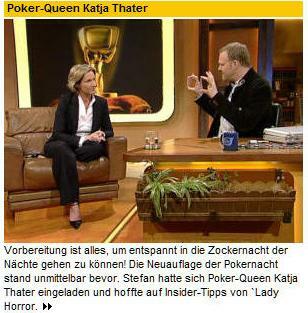 Katja did some more commentary for the World Cup Of Poker on german sport channel DSF. Afterwards she went to Cologne to be a interview guest in TV Total, the biggest late night show in germany, hosted by Stefan Raab. Click on image to view her in the show.